It’s a New Year: Where is it Taking You? 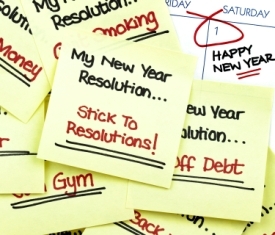 When it comes to New Year’s Resolutions there are several approaches. There are the out-of-touch-with-reality optimists who make hugely confident statements about what they really believe they will accomplish in the coming year: lose 70 pounds by Valentine’s Day, get up at 4 AM every day to study the Bible in Greek, climb Mt. Everest, save 50% of every paycheck, cure cancer. When they make these goals these folk actually believe they will do it all. Then there are the low-ballers who are afraid of being too ambitious, so they intentionally make safe goals that don’t matter: eat breakfast at least 2 days a week, go for a walk. Of course there really is no point to making goals like this, but at least you can say you met your goals. Sooner or later those who make unrealistically grandiose goals and those who set meaninglessly small ones end up in the same place: right where they were last year. Nothing changes. It doesn’t matter what your goals are — if you don’t have actionable steps to make it happen, it won’t. And yet I think most of us feel a tension when the calendar page flips to a new year. We see an opportunity to turn a new page in our lives as well. And yet we fear failure, or have been burned from past foiled attempts at mustering up change in our lives. Maybe you suffer from goal-setting fatigue. We don’t want to set goals we don’t meet. So we just roll forward, missing the opportunity New Year’s brings. The cynic in us says, “What’s the use?” A subtle sense of defeat talks us out of taking ourselves seriously when we want to set a new goal. But I’m a huge fan of setting goals. And I do think it’s a big miss if you don’t use the New Year to set some. Someone recently asked me to pull back the curtain on how I go about goal setting. I won’t’ go into strategic planning and leadership stuff here. But I am happy to share some simple thoughts that have helped me in self-leadership, and can help you too. Start by assessing where you are in your life right now. Now follow me here. You have arrived at that place in your life as a result of the trajectory you have been on. The trajectory of your life is determined by steps you take each day. Do you see the truth of this profound but simple idea? Where you end up in life comes down to small steps you take each day. Small steps repeated lead in a definite direction, which determines your destination. A long-obedience in the same direction is what makes up our lives, one way or another. So how do you determine what steps you take each day? That’s a question everyone should answer. Because your daily movements eventually translate to a trajectory, which in turn lead you to where you in fact end up in your life. Today’s steps make up tomorrow’s trajectory which determines your destination. So who is deciding your daily steps? Amazingly, many people blame others when they don’t end up where they want to be in life. As if someone else were determining their daily steps. Each of us has power to decide so many daily steps. How do you decide yours? Or, you take deliberately intentional steps each day that lead toward the destinations you desire. Christ followers can ask God to provide clarity about where you want to end up – for example, with relationships that are healthy, with a spiritual life where you hear from God and serve him regularly, with a mind that has learned things, or with a heart that has absorbed some scriptural truth, and so on. Those are desired destinations. But you won’t get there by drifting or by accident. In fact it doesn’t matter what it is — learning how to order in Spanish at Taco Bell, being a better listener, training your dog to sit, providing clean water for people in Africa, praying better, or doing something to help address systemic race issues — you won’t arrive anyplace worthwhile in life without some intentionally chosen steps that will form a trajectory toward it. The steps you take each day begin with goals you set which help you take those steps. Said another way, a dream without a goal and a deadline remains a dream. Stephen Covey used to say, “Start with the need in mind.” I need to have a picture in my mind of what I want said at my funeral. What kind of husband do I want to be? How would I like my kids to remember me? What kind of legacy do I hope to leave? Where do I want to be financially in a year? What do I want to weigh? How many books will I have read? You get the idea. Those end visions are places you arrive as a result of a trajectory. That trajectory is determined by daily steps and choices. Those steps come only when you set a goal. A goal is a measurable outcome with a date attached. I’m a fan of using the month of January to listen to my life, as God speaks through circumstance, scripture, and friends to figure out where I want to end up in my life. Get the vision. Then I like to set goals that will order my daily steps so I have a map to my actions which can help fulfill short and long term dreams. What kind of family do you want to have? What kind of connection with God? What kind of learning do you hope to have? Will you be a more naturally prayerful person? Do you hope to have a better understanding of God’s will in your life? Do you want to be in better health in 12 months? Do you hope to have deeper friendship with someone? Do you hope to have less worry occupying space in your brain? Figure out where you want to end up. Listen to God and others for ideas. Press toward clarity. Prioritize the long list that comes to mind. Be quiet and think deeply. Write things down until you sense you’re at something that feels like it’s the most important stuff that will lead you toward the version of yourself God has in mind as you grow forward. 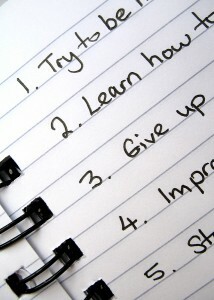 Then set some goals that are measurable. You have to know if you hit it or not. There has to be an end date for the goal. Don’t make it December 31. Make it sometime much sooner. Write that date on your calendar and check on yourself to encourage your progress. Then break it down to daily steps, something you can do each day. And make it realistic. Don’t shoot for the moon. If you want to be more prayerful by the end of 2016, don’t start by saying you will rise at 4 AM and pray for three hours every day. Unless you think you can do that. Perhaps noting the lunch hours when you will slip away and pray is a better approach. Or a nighttime moment of quiet with the Lord? But make a step that you can take each day. Don’t get bogged in details. The point is, do something that will help you ruthlessly challenge status quo. Change something! Upset mediocrity. Prune something. Pursue a God-given dream. Don’t go stagnant. Play to your strengths. Work on a weakness. This is about growth and new life. Let that new thing happen in your life because you set goals and took steps toward them. Because today’s steps make up tomorrow’s trajectory which determines your destination. In future posts I’ll share some of my goals and suggest some areas to think about. RT @bobgoff: The way we love the people we don't agree with is the best evidence that the tomb is really empty. Good stuff, and by the way, tell that young pup that the Bel Air Campus said he delivered a great message on Sunday! I was thinking about what my “one word” might be during his sermon, and was coming up blank. The very moment we bowed our heads, it popped into my head. Such is prayer. Such is our Lord. Imus’ comments were racist and sexist. He should be fired, not given what amounts to a two-week vacation. Sometimes I forget that “Talk Show Radio Host” and “Complete Jerk” are often syunnymoos.